USA Today reporter Art Stapleton reports that the New York Giants have suspended cornerback Dominique Rodgers-Cromartie. The tenth-year veteran left the Giants facility on Wednesday, which prompted the indefinite suspension. After ending the 2016 season with the fifth-highest grade among cornerbacks (89.9), the veteran corner is off to a good start in 2017, and is currently ranked 30th of 110 cornerbacks with a grade of 80.3. Through five games of the 2017 season, he has arguably been the team’s best player in coverage. 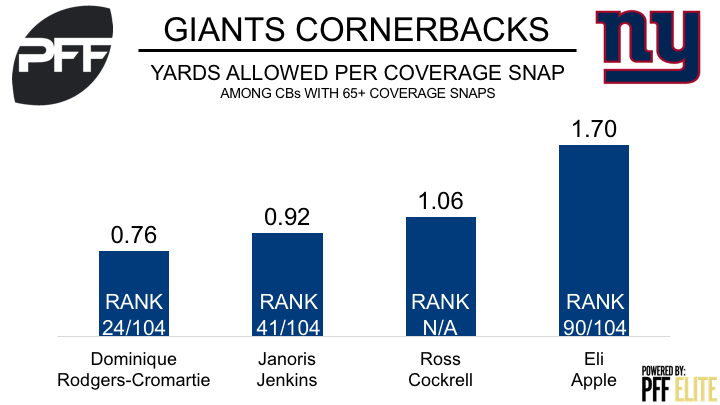 He’s played 138 cover snaps and has allowed 105 yards on 15 targets at an average of 0.76 yards per cover snap that comfortably ranks first among Giants’ corners. With Rodgers-Cromartie out, fourth-year cornerback Ross Cockrell will likely be the next man up. Cockrell has played 49 coverage snaps so far this year and allowed an average of 1.06 yards per cover snap, the second highest mark among his teammates.